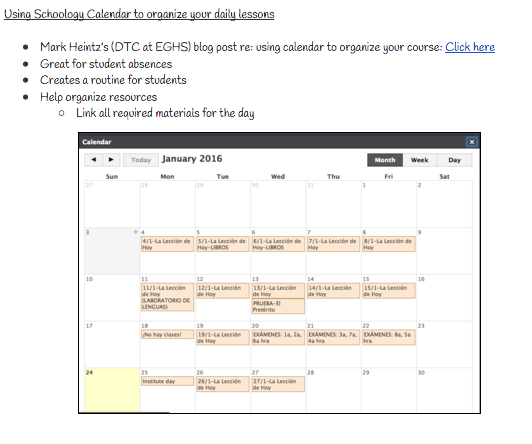 The Collab Blog: Schoology Resource Bonanza! 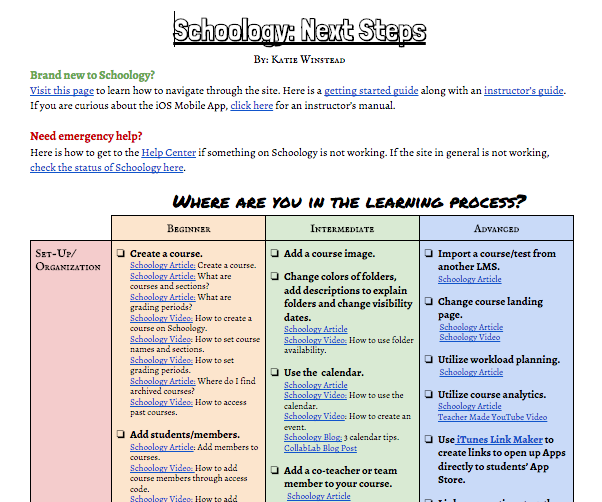 Are you new to Schoology? Have you started but still have a lot of questions? Do you consider yourself an advanced user? Check out this link to access the doc! At our January Institute Day Division Technology Coaches Rachel Barry, Kirsten Fletcher, Mark Heintz, Kim Miklusak and Quinn Loch joined Katie and they facilitated Spark sessions and Learning Labs to share many examples of myriad ways that Schoology can impact student engagement and learning. Two of our colleagues at Buffalo Grove High School, Danielle Ossman and Laura Heissel, also led sessions on Schoology. Check out this helpful resource from their session. We are excited about the collaboration across our schools and we look forward to sharing more examples of the ways that we are engaging students in learning. Do you have examples to share? Can we help you take next steps? Come see us in the Collab Lab!